Cro-Magnon Man's name is a latin phrase meaning 'Big Hole'. Cro-Magnon Man lived from about 100,000 years ago to about 10,000 years ago. This group lived in Europe, Asia, and Africa. But unlike Neanderthal, not in Russia. Cro-Magnon's brains were larger than Neanderthals' and therefore had more capacity for thinking. Cro-Magnon had the same shaped bodies and skulls as modern day humans, but they had more rounded brain cases, and pointed chins. Their foreheads were flat and only had very slight eyebrow ridges. Their jaws and noses were much smaller than earlier groups' were. Their teeth were also smaller and more crowded together. Theor faces were straight instead of jotting together, And the larnyx postioning is very different than any other groups so therefore they were able to make communicative language or speech. 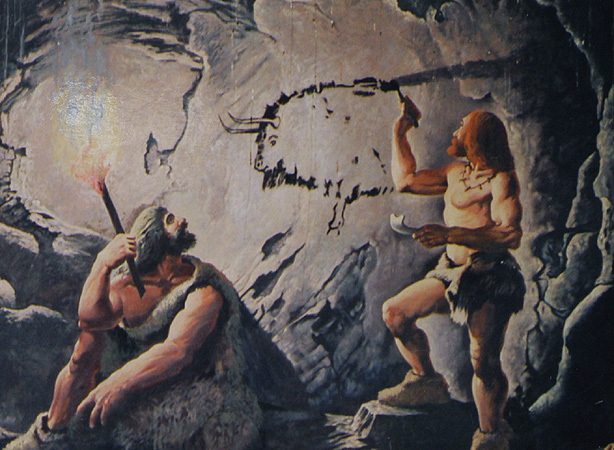 In this picture two men from the Cro-Magnon group are recording stories on the walls of a cave, one writing, the other holding light for the other. Cro-Magnon, as well as Neanderthal Man wore clothing, Cro-Magnon's was made of leather, although both groups made their clothing from animal hides, Cro-Magnon was now able to make pants, tunics, and dresses. The process of making these sounds very simple and short, but took a very long time. They had to skin the animal, scrape the fat, punch holes, sew the peices of hide together, all to make pants, and other more advanced peices than the Neanderthal Man could have. Cro-Magnon hunted with axes, uaually flint bladed, chisels, like the tools called burins, which wee used to splait or shape stones. Antlers were made into harpoons, and there are many other tools that have been improved by Cro-Magnon since the Neanderthal Man as in the Burin, which is a sharp pointed tool used to drill holes into needles and beeds, a harpoon, which is a barbed spear point which would get tied to a long throwing shaft or stick with sinew or in other words string of their time. A needle used for sewing clothing and covers for shelters, made of bone or antler, with a hole at the end for the animal sinew to be threaded through, or and arrowhead which was only used in the later years of the group Cro-Magnon along with the bow and arrow. Cro-Magnon usually lived in caves or huts, and made jewelery with fish bones, rocks and bits of egg shells. This is what they did for recreation, unlike most other tribes we have been talking about. Cro-Magnon also had the same shaped bodies and skulls as modern humans do. As well as Neanderthal Man their larnyx was in a position which made them able to make communicable speach or language. They also were the first to make staright backed knives. Cro-Magnon and Neanderthal may be similar in image and appearance, but are very different in culture because of the time span they lived, Neanderthal lived during the ice age, while Cro-Magnon did not. Therefore their cultures would have been very different.